For two summers, we had a CSA share which filled our bellies with both delicious produce for 20 weeks and dread about making the most of summer’s bounty without waste. The challenge was fun, but exhausting. Last year, we took a break. However, I have to admit that I felt a little left out. Every week, I volunteered for half a day in the fields at Lexington Community Farm and published a newsletter for the shareholders to help them make the most of that week’s share. While I could (and did) shop in the farm stand, I felt left out of the enthusiastic banter of the CSA shareholders. So after a one-year hiatus, I decided to jump back into the summer CSA fray. Fortunately, this year Lexington Community Farm offers a 10-week share, where the pickup is every other week throughout the full season. I’m hoping this option will relieve the flow of food and the pressure I felt as abundant produce seemed to multiply in the kitchen. I’ve handed off the weekly newsletter to someone else, but the question of how to best enjoy the week’s offering is still a puzzle I enjoy solving. As I work it out, I’ll share the result with you. For the first week, here goes! The first task on arriving home is to access what needs to be eaten first and how to store what I won’t get to until tomorrow (or later). I’ve had good luck wrapping greens in a paper towel (dry if the greens are somewhat wet or damp if they are dry) and stowing them in a large plastic bag or a large airtight container. As long as they aren’t too wet, greens can last up to a week or so this way. I’m big on using the “bonus” vegetables, the parts that many people discard or compost. 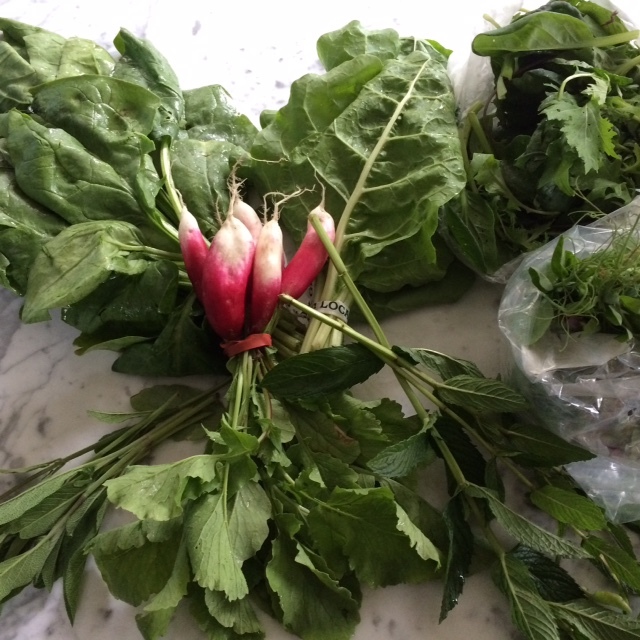 This week, I consider the radish greens as a bonus. Not sure how I’ll use them, I cut them off the radishes, wrap them in a paper towel and store them with the other greens. I find that fresh herbs last longer in “vases” of water instead of plastic bags. As with cut flowers, trim a little bit off the base of the stem and place them in water. My assortment of small pitchers gets extra time outside the cabinet, and with the herbs visible on the counter, I remember to use them. The first week’s share was on the small side, so we polished it off within a few days. That means I’m writing this in retrospect, sharing what I made not what I’m planning. Sage: In addition to the sprigs of sage in my share, the sage plant in my backyard herb garden was flowering. 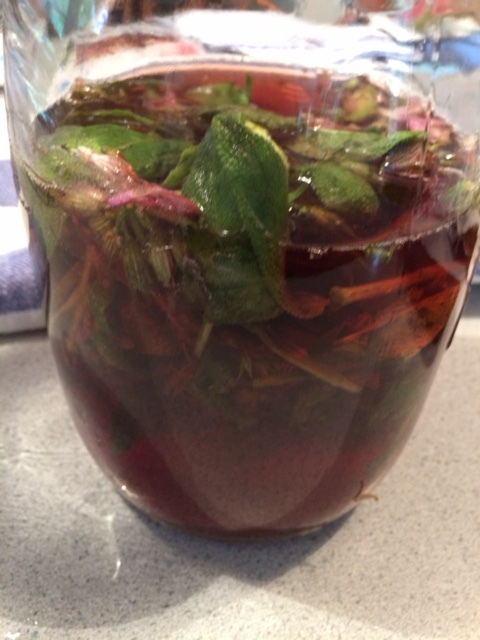 With a plentiful amount of fresh sage ready to go, rather than add it to the week’s meals, I decided to infuse the sage in red wine vinegar for a flavored vinegar to use later. Mint: A few sprigs of mint cried out to be muddled into mojitos for Friday-night start-of-the-weekend cocktails. Greens always surprise me when they cook down from generous bunches to just a handful. I combined this week’s spinach, Swiss chard, and radish greens to make a mixed greens quiche, one of my favorite ways to eat cooked greens. 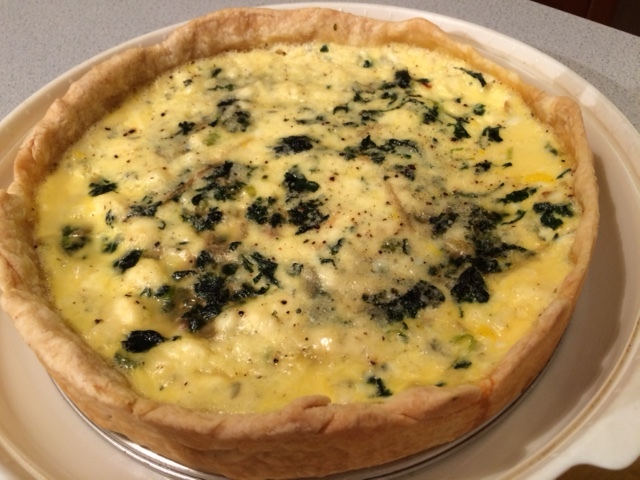 Quiche is one of those flexible recipes that can be varied to different fillings, seasonings, and cheeses. For this week’s version, I sliced one stalk of green garlic and added some crumbled blue cheese. I also experimented with the pastry crust, adding some stone-ground cornmeal for some added texture. The braising mix was a combination of baby greens including mustard, mizuna, and other greens I couldn’t identify. I sautéed the greens with minced ginger and garlic as a bed for salmon fillets and shiitake mushrooms steamed in foil packets with an Asian sauce. Pea tendrils would have made the perfect garnish (as called for in the recipe), but we had already eaten them! 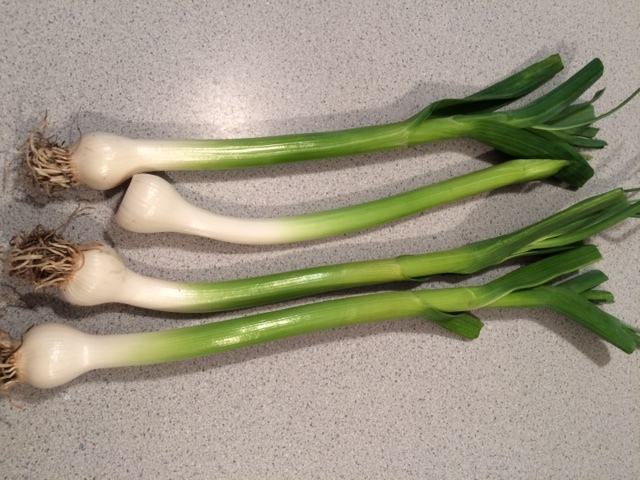 I’d never made anything with green garlic before, so I bought a few stalks when I picked up my share. 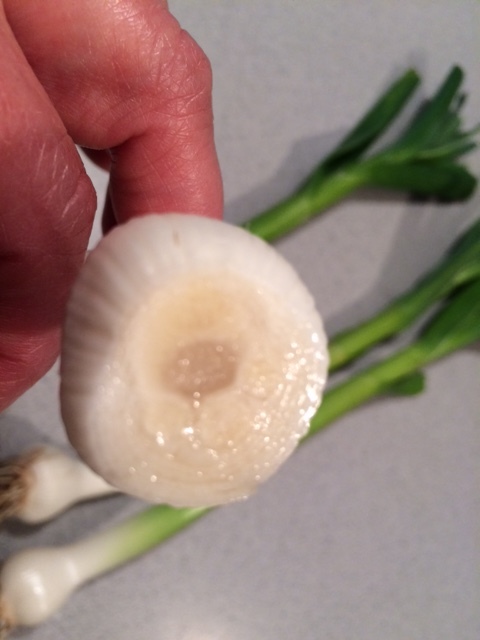 When you slice through the bulbous end of the stalk, you can see the little cloves of garlic waiting to develop into garlic bulbs that are harvested at the end of the summer. The flavor is definitely garlicky, but with a milder bite. If you look carefully, you’ll see tiny cloves ready to grow! I added one stalk to the quiche. 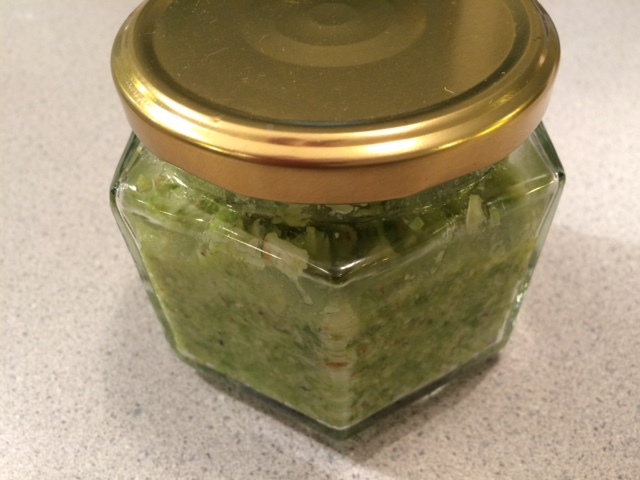 With the remainder, I made a green garlic pesto. I like garlic’s bite, but it could be mellowed by blanching the green garlic before making the pesto. The pesto is quite versatile. So far, I’ve used dollops of the pesto on pasta, mixed with mayonnaise to dress a potato salad, and as a condiment for pan-fried fish. I’ll be picking up my next share later this week, so check back to see what I get and how we eat it! Let it sit in a cool dark place for 1-4 weeks. Taste weekly. 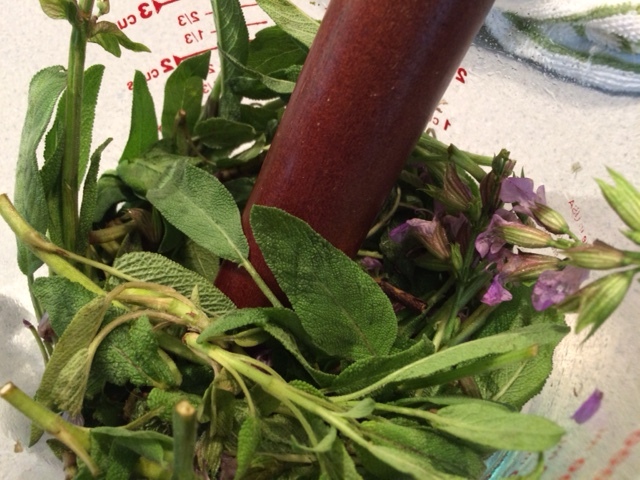 When you like the strength of the infusion, strain out the sage and transfer the vinegar to clean bottles. 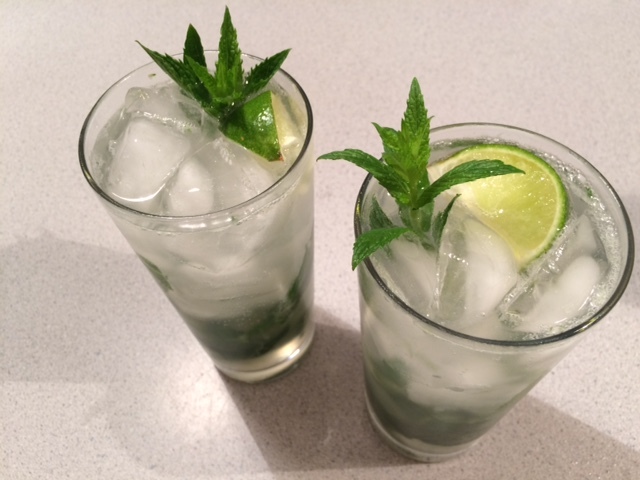 In a tall glass, muddle mint leaves with lime juice. Add simple syrup. Fill glass with ice. Pour rum over the ice and top the glass with club soda. Garnish with a lime wedge and a sprig of mint. To make the dressing, combine all the ingredients in a small jar and shake well until combined. Taste for seasoning. 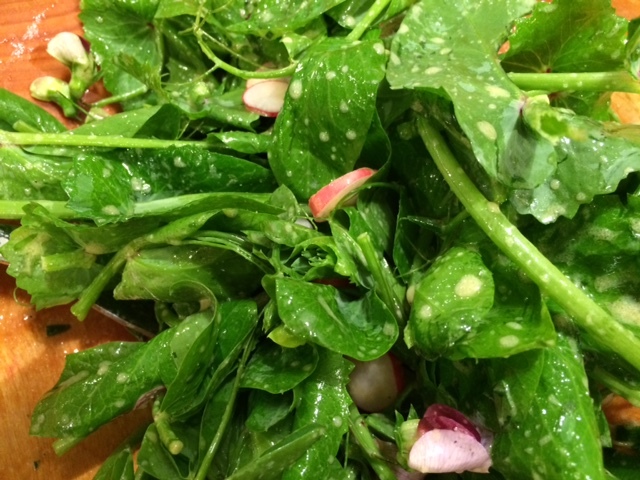 Toss the pea tendrils and radishes with the dressing. You won’t use all the dressing. Save it for another salad. Cut the bulbous end off of the green garlic and cut it in half. Slice the remaining stalk into 1-inch lengths. Place the Parmesan and almonds in a food processor and pulse until coarsely ground. Add the green garlic and pulse until chopped. With the food processor running, add the olive oil and process until the mixture forms a thick paste. Season with salt and pepper. Roll out the pastry crust to a 12-13-inch circle. Fit it into a 9-inch springform pan, going 2 inches up the side and folding the extra pastry over to reinforce the sides. Prick the crust all over with a fork. Cover with plastic wrap and chill for at least 30 minutes. Preheat the oven to 425F. Line the crust with parchment paper (or foil) and fill with pie weights (I use dried beans reserved for this purpose). Bake the crust for 15 minutes. Remove the parchment with weights. If any areas puffed up, prick them again with the fork to let out the air. Let the crust cool while you prepare the filling. In a skillet, heat 1 tablespoon of olive oil over medium heat. Add the sliced onion and a large pinch of salt. Reduce heat to medium-low. Sauté the onion, stirring often, until it’s lightly golden, about 5-10 minutes. In a larger pan, heat another 1 tablespoon of olive oil over medium heat. Add the greens, in handfuls, to the oil. If the volume exceeds your pan, wait a minute or so until the greens reduce and you will have room to add more. Cover the pan, and let the vegetables cook down until they are completely wilted and cooked through. With tender greens like spinach and chard, this will take 2-3 minutes. Periodically taste them to see if they’re ready. Drain, pressing out excess liquid, and coarsely chop the greens. Combine with the onions and add sliced green garlic, if using. Season with salt and pepper. In a bowl, make the custard by whisking the eggs and milk together. Season with salt and pepper. Place the pan with the crust on a baking sheet. Spread the greens mixture over the bottom of the partially-baked crust. Sprinkle with blue cheese. Pour in the custard. Bake for 1 hour, until the top of the quiche is lightly browned and the center is set. Cool slightly before serving. Can be served warm or at room temperature. 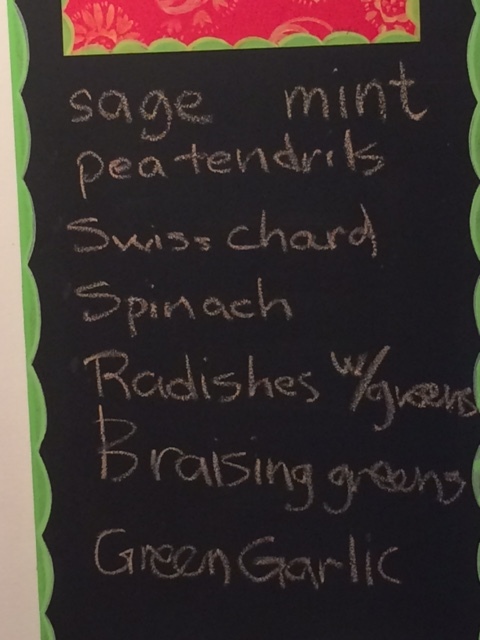 Posted on 15 June 2016, in Summer CSA and tagged green garlic, mint, pea tendrils, pesto, quiche, sage, salads, vinegar. Bookmark the permalink. 6 Comments. Wow! So much goodness right from the very first box. I love how many dishes you made from your share. I’m especially intrigued by the green garlic pesto, but all your recipes sound delicious! My favourite thing to do with radish leaves is to make pesto or furikake. Looking forward to more posts! I’m going to try Clothilde’s (Chocolate & Zucchini) Radish Leaf Pesto this week. Tell me more about how you make furikake with radish leaves! Thanks! I will try it and let you know how it comes out! Wonderful choices Betsy! Sounds as if you are getting into the full swing of maximizing the season’s produce, lots of fun too. Enjoyable Post! We tried a CSA one year and I too enjoyed the challenging of using it all each week. Unfortunately, it was packed with too many of my husband’s least favorite vegetables, so we haven’t done it since.